ITBP Recruitment 2018 Notification – Get Here Online ITBP Important Dates, Eligibility Criteira, Pattern & Syllabus, Selection process & Vacancies details for constable & head constable mechanic etc. 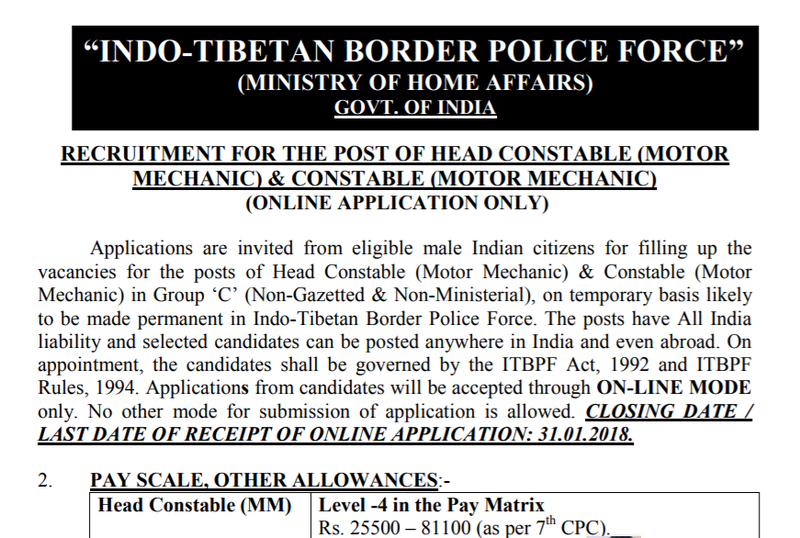 ITBP Recruitment 2018: The Indi tibetian Border force has released official notification for the Head Constable & Contable (Motor Mechanic) posts. Head Constable (MM)- 10+2 pass with Certificate in Motor Mechanic and 03 years experience or Three years Diploma in Automobile Engg. Check here online ITBP Head Contable, Contable (Motor Mechanic) Post. Application fees and age limit.